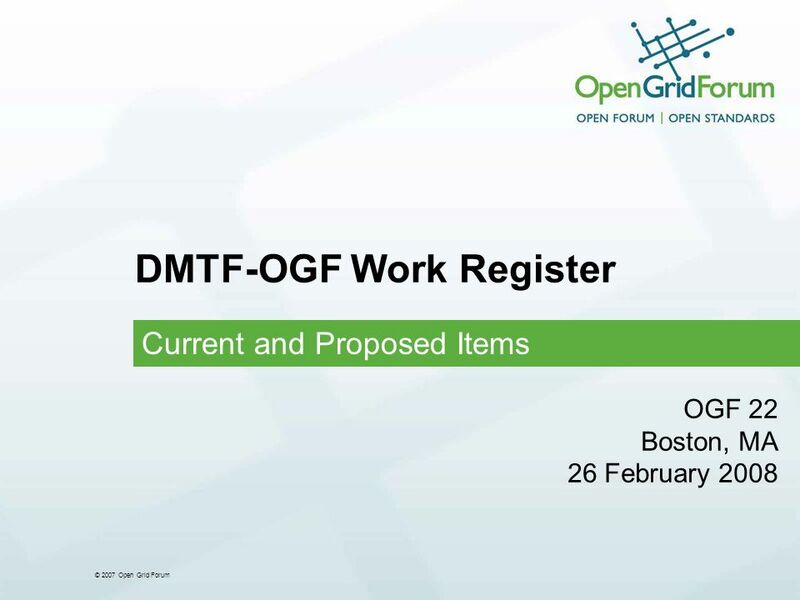 © 2007 Open Grid Forum DMTF-OGF Work Register Current and Proposed Items OGF 22 Boston, MA 26 February 2008. 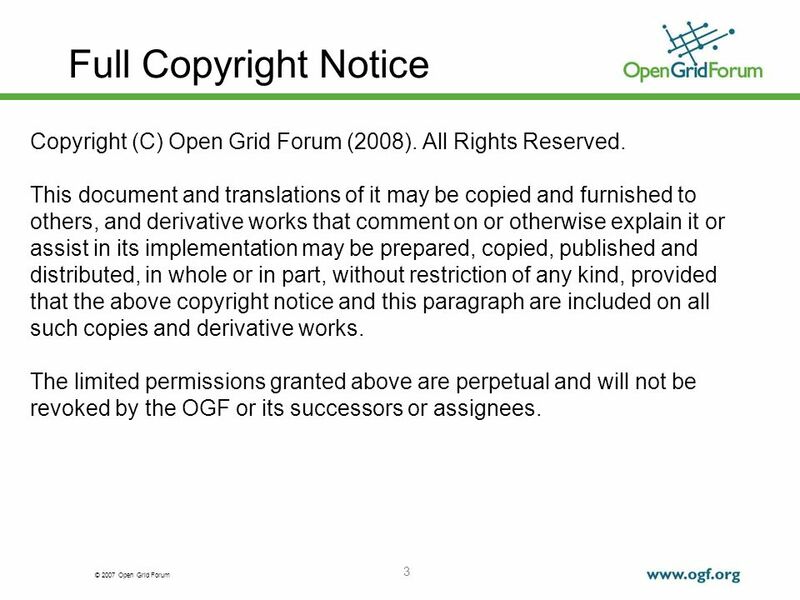 2 © 2007 Open Grid Forum 2 OGF IPR Policies Apply I acknowledge that participation in this meeting is subject to the OGF Intellectual Property Policy. Intellectual Property Notices Note Well: All statements related to the activities of the OGF and addressed to the OGF are subject to all provisions of Appendix B of GFD-C.1, which grants to the OGF and its participants certain licenses and rights in such statements. Such statements include verbal statements in OGF meetings, as well as written and electronic communications made at any time or place, which are addressed to: the OGF plenary session, any OGF working group or portion thereof, the OGF Board of Directors, the GFSG, or any member thereof on behalf of the OGF, the ADCOM, or any member thereof on behalf of the ADCOM, any OGF mailing list, including any group list, or any other list functioning under OGF auspices, the OGF Editor or the document authoring and review process Statements made outside of a OGF meeting, mailing list or other function, that are clearly not intended to be input to an OGF activity, group or function, are not subject to these provisions. Excerpt from Appendix B of GFD-C.1: Where the OGF knows of rights, or claimed rights, the OGF secretariat shall attempt to obtain from the claimant of such rights, a written assurance that upon approval by the GFSG of the relevant OGF document(s), any party will be able to obtain the right to implement, use and distribute the technology or works when implementing, using or distributing technology based upon the specific specification(s) under openly specified, reasonable, non- discriminatory terms. The working group or research group proposing the use of the technology with respect to which the proprietary rights are claimed may assist the OGF secretariat in this effort. The results of this procedure shall not affect advancement of document, except that the GFSG may defer approval where a delay may facilitate the obtaining of such assurances. The results will, however, be recorded by the OGF Secretariat, and made available. The GFSG may also direct that a summary of the results be included in any GFD published containing the specification. 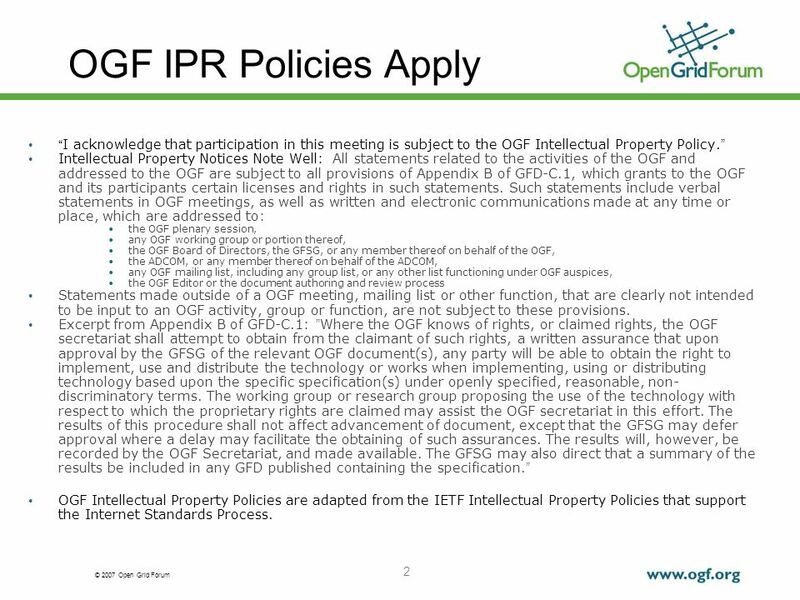 OGF Intellectual Property Policies are adapted from the IETF Intellectual Property Policies that support the Internet Standards Process. 3 © 2007 Open Grid Forum 3 Full Copyright Notice Copyright (C) Open Grid Forum (2008). All Rights Reserved. This document and translations of it may be copied and furnished to others, and derivative works that comment on or otherwise explain it or assist in its implementation may be prepared, copied, published and distributed, in whole or in part, without restriction of any kind, provided that the above copyright notice and this paragraph are included on all such copies and derivative works. The limited permissions granted above are perpetual and will not be revoked by the OGF or its successors or assignees. 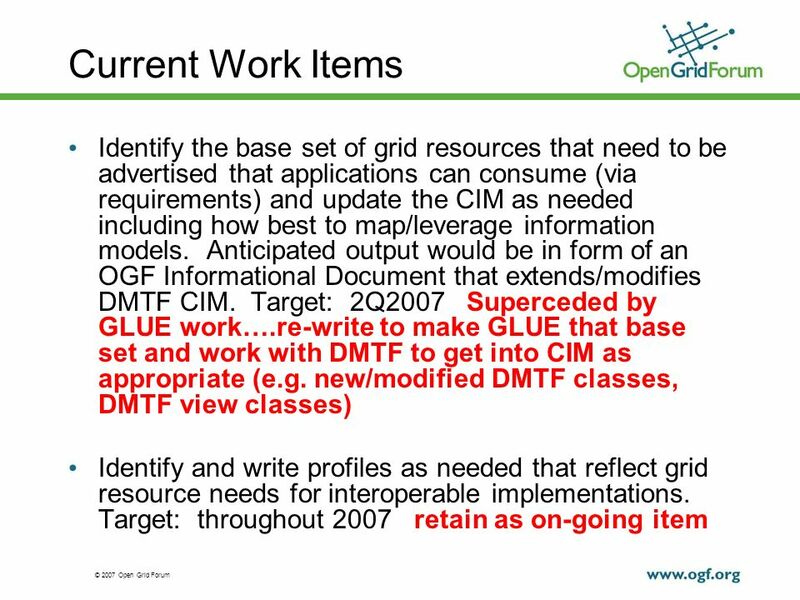 Download ppt "© 2007 Open Grid Forum DMTF-OGF Work Register Current and Proposed Items OGF 22 Boston, MA 26 February 2008." © 2006 Open Grid Forum GHPN-RG Status update co-chairss:Cees de Laat Dimitra Simeonidou GGF22, Boston, February 2008. © 2006 Open Grid Forum Discussion of File Catalog Standardization GFS-WG, OGF24 Singapore Osamu Tatebe, co-chair of GFS-WG Univ. of Tsukuba Sep 16, 2008. © 2006 Open Grid Forum JSDL 1.0: Parameter Sweeps OGF 23, June 2008, Barcelona, Spain. © 2006 Open Grid Forum Network Services Interface OGF30: Connection Services Guy Roberts, 27 th Oct 2010. © 2006 Open Grid Forum Ellen Stokes, IBM Michel Drescher, Fujitsu Information Model, JSDL and XQuery: A proposed solution OGF-19 Chapel Hill, NC USA. © 2006 Open Grid Forum Network Services Interface Introduction to NSI Guy Roberts. © 2006 Open Grid Forum JSDL 1.0: Parameter Sweeps: Examples OGF 22, February 2008, Cambridge, MA. 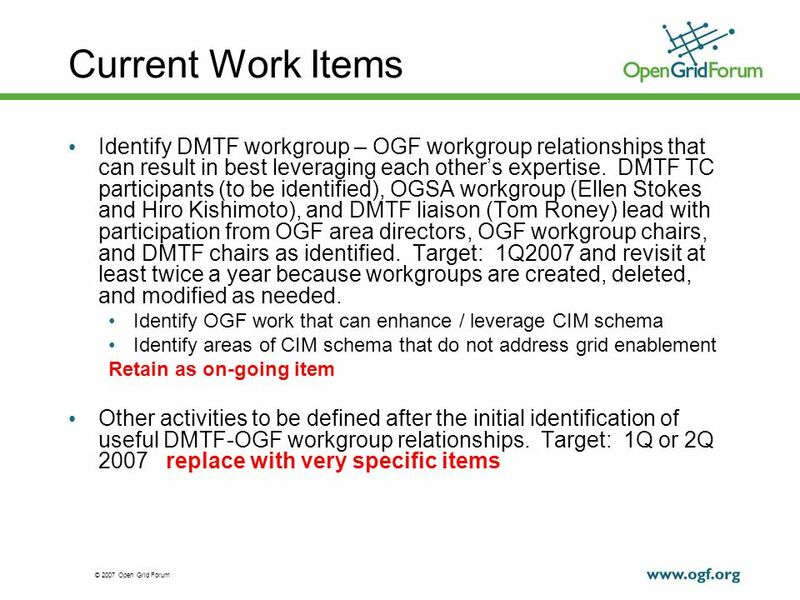 © 2006 Open Grid Forum OGF19 Federated Identity Rule-based data management Wed 11:00 AM Mountain Laurel Thurs 11:00 AM Bellflower. © 2007 Open Grid Forum JSDL-WG Session OGF27 – General Session 10:30-12:00, 14 October 2009 Banff, Canada. ©2010Open Grid Forum OGF28 OGSA-DMI Status Chairs: Mario Antonioletti, EPCC Stephen Crouch, Southampton Shahbaz Memon, FZJ Ravi Madduri, UoC. © 2006 Open Grid Forum JSDL Session (CIM Job) OGF 21 - Seattle, 17 October 2007. © 2006 Open Grid Forum Joint Session on Information Modeling for Computing Resources OGF 20 - Manchester, 7 May 2007. © 2007 Open Grid Forum JSDL-WG Session OGF21 – Activity schema session 17 October 2007 Seattle, U.S.
© 2006 Open Grid Forum 2 nd March 09 Enterprise Grid Requirements Research Group OGF25 EGR-RG Session Group. © 2006 Open Grid Forum OGSA Next Steps Discussion Providing Value Beyond the Specifications. © 2006 Open Grid Forum Network Services Interface OGF29: Working Group Meeting Guy Roberts, 19 th Jun 2010.